I am asked frequently to recommend places in the Shenandoah Valley near our home in Rockingham County that are great places to take beautiful photographs. I love to take photos of many beautiful places in our area, but I tend to return frequently to what I call my photo “fishing holes.” I have four major criteria for choosing photo “fishing holes:” 1) they must be places that are beautiful in all seasons; 2) are easy to get to, meaning no more than 30 minutes from Harrisonburg; 3) safe; and 4) access is free. In this fall 2018 edition I am going to show pictures of these “fishing holes” in autumn and exact directions to each. As of this posting the leaves are way behind normal, meaning they have not peaked in the Valley. The Shenandoah River is such a beautiful, winding and historic river. One of my favorite songs is “Oh Shenandoah.” Surprisingly, I have found it difficult to find places that meet my “fishing hole” criteria. Mostly I see it from bridges crossing the river at Island Ford, Route 33, and Port Republic. I don’t like taking photos from bridges, so I have had to look for a good Shenandoah “fishing hole. Fortunately, I found one. My Shenandoah River “fishing hole” is about 10 minutes from our home in Penn Laird and is very easy to reach. Drive east from Harrisonburg on Route 33 for about 8 miles from Valley Mall. Take a right onto Island Ford Road (Route 649) at the light in McGaheysville. In 2.5 miles you will cross the Shenandoah River. Take an immediate right turn onto Captain Yancey Road and follow the road to the right less than 50 yards and you will see the parking lot on the right. Walk down to the river and you can shoot both North and South. This is not a good place to photograph the river when the water is high. Remember, the Shenandoah River flows North. When you travel North to South in the Shenandoah Valley you are going up the valley. There are a zillion places in the area to take beautiful pictures of the Massanutten Mountain. The Massanutten peak is the defining geological feature in our part of the Valley. We have a fabulous view from our home in Penn Laird. I found a nice place to take pictures right off Route 33 in Penn Laird not more than three miles from Valley Mall. Drive east on Route 33 for approximately three miles. There is a new park on the northern side of Route 33. You will notice a new shopping strip on the left. Take a left off 33 into the park. Park your car along the side of the road into the park. Climb the short embankment and you should have a beautiful view of the Massanutten. The view is especially nice later in the afternoon when the light is best. Occasionally you will see a rainbow. Lake Shenandoah is one of my favorite “fishing holes” that is less than 10 minutes from Valley Mall. I return there in all seasons, usually early morning and late afternoon. There are beautiful lilies in the summer. 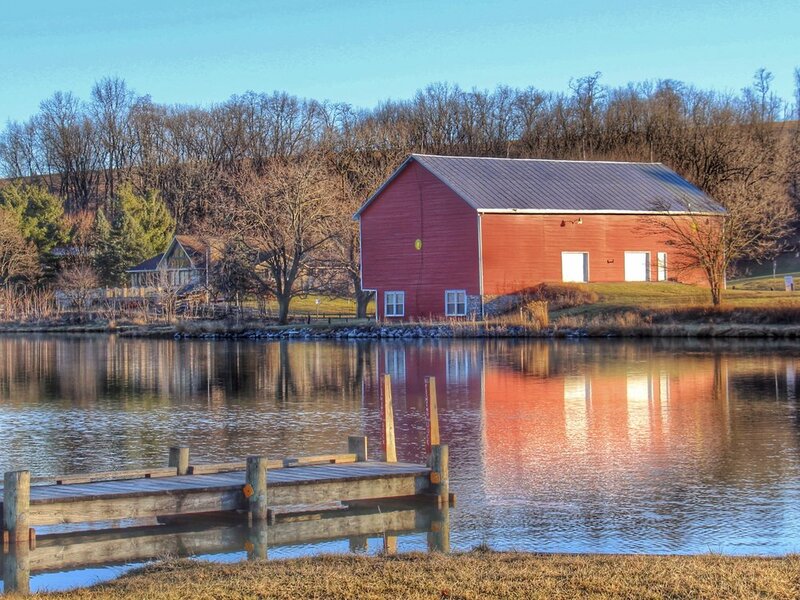 The Isaac Walton League barn makes for iconic photos. Take 33 East from Valley Mall for 1.3 miles. Turn right onto Massanetta Springs Road (Route 687). There is a 7/11 on the corner. Follow Massanetta Springs Road for 1.9 miles. Turn left into the parking lot at Lake Shenandoah. I love to visit Silver Lake near Dayton at any season. It’s a beautiful lake and there is an iconic view of Silver Lake Mill. I understand it is a great place to fish. I took one of my favorite fall pictures here a few years ago. From Valley Mall take Neff Avenue until it ends in Route 280 (Stone Spring Road). 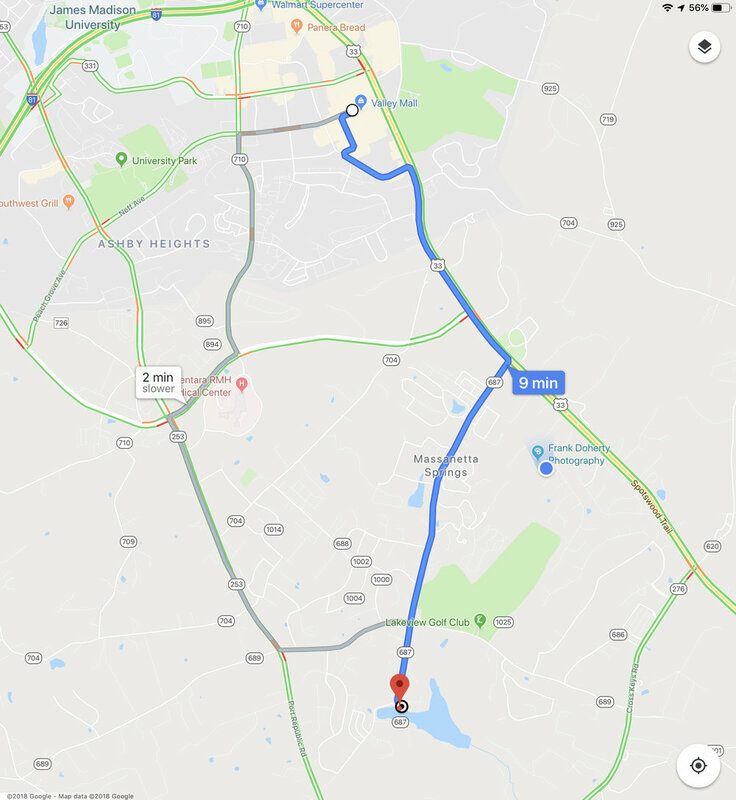 Take a right onto Route 280 (Stone Spring Road) and follow it for 2.3 miles until it gets to Route 42. Turn left onto Route 42 heading toward Dayton. Follow Route 42 for 1.9 miles until it gets to Eberly Road. Turn right onto Eberly Road for 0.3 miles. At the intersection with Route 701/College Street turn right and follow the road 0.3 miles. The lake will be on your left. The is by far my favorite place to visit. It’s quiet, beautiful in all seasons, and reasonably accessible. My office used to be a five-minute walk, but now it takes me 15 minutes to drive from my home. It’s six minutes from the Mall. There is a beautiful pond with a walking trail. Also, there are nice woods for a short hike. Parking can be a bit tricky, but it’s easy to find a parking space in the early morning. Don’t miss this place! Thanks for taking the time to read this blog. I plan to refresh this blog with seasonal shots from each location. As I continue to explore this amazing area I hope to add more sites. If you have any questions or suggestions, you can contact me at dohertfj@gmail.com.